Jaaga (meaning 'space' in Kannada), based in Bangalore, India, seeks to nurture innovative endeavors by providing space, core infrastructure, and a diverse social environment. Born in August 2009 from a desire to bring the arts and technology communities closer together, Jaaga explores new ways of using pallet-rack shelving to create a modular and mobile community space in a dense urban landscape to foster innovation. The design and building process, as well as the vision for this project come from Jaaga's Founder-Directors - Freeman Murray and Archana Prasad and has been, and continues to be, an open and collaborative effort involving the community and several volunteers. The land Jaaga currently sits on has been generously made available by Naresh Narasimhan, an eminent architect for the city and also Jaaga's Chairperson. Jaaga's core team include Santhosh Kumar (Program Co-ordinator), Kiran (Facilities Manager) and Mohammed (our all-round helper). The Media Center, Electronics Lab, Habitat Center, our little cafe, our community events, our residential programs and fellowships bring in a diverse group of people from around the world. Going forward Jaaga will announce the birth of its Tech Center as well as Culture Center that will help focus Jaaga's commitment to bring the technology and the arts communities closer together. Jaaga provides infrastructure and mentoring to tech startups, conducts educational workshops for aspiring students, and supports local groups and individuals who are proactively engaged in social and environmental issues. Our Media Center hosts an open call for Fellowships and Expert Collaborations for people who are highly trained in online and digital media practices be it in sound, video and interactive processess. It offers workshops for passionate students interested in internet based media production. The Center trains people in new media technologies. It includes web enabled co-work spaces and multi-level spaces for screenings, workshops, lectures and performances. In addition, Jaaaga hosts an Electronics Lab where our people work on next generation lighting systems. The Jaaga structure is unique, modular, low cost and incorporates eco-friendly elements. Pallet Racks form the core element of the architecture. Their heavy load-bearing capacity, availability, low cost, and extreme flexibility lend themselves to efforts to build high density temporary buildings in urban environments. With it we hope to demonstrate a variety of techniques for living sustainably and having fun in eco-friendly, low-cost DIY structures. Currently we are collaborating with Eve Sibely - Founder of World Food Garden, Shrishti School of Art, Design and Technology and Interartivos on The Living Building Project that is focused on creating vertical and rood-top gardens for urban agriculture. This lab, run by Srikanth and Sai, explores cutting-edge innovations LED lighting technology. With a very DIY attitude, our Electronics Lab people explore ways that push the envelope on human-light and machine interactions. 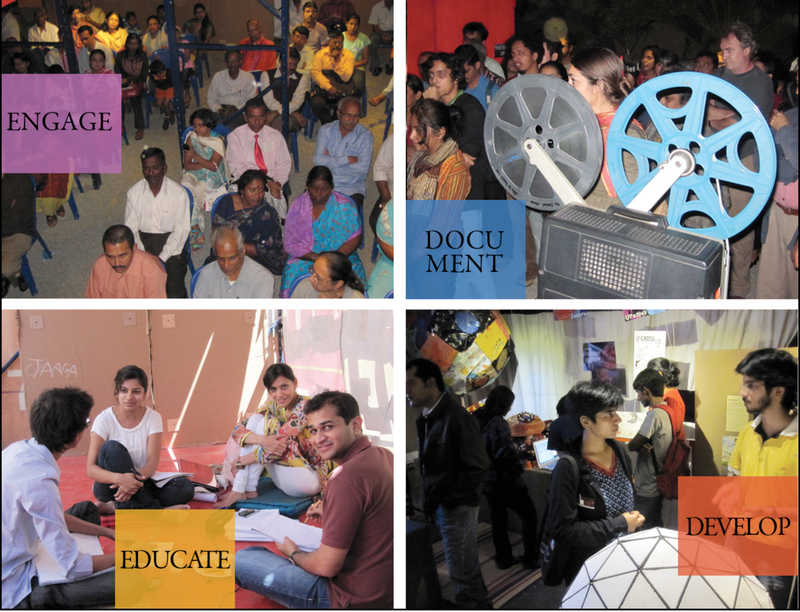 Jaaga is all about about offering space to creative practitioners so that they can share their practices amongst each other and the interested public. We encourage activism, open sharing and entrepreneurship by hosting an open call to the community to use our building for their activities. We encourage barter or resource sharing of expertise to be the currency in lieu for using our space if the events that are hosted are free to the public. If the events are ticketed, then based on the nature of the organisation hosting the event we might charge a nominal fee.